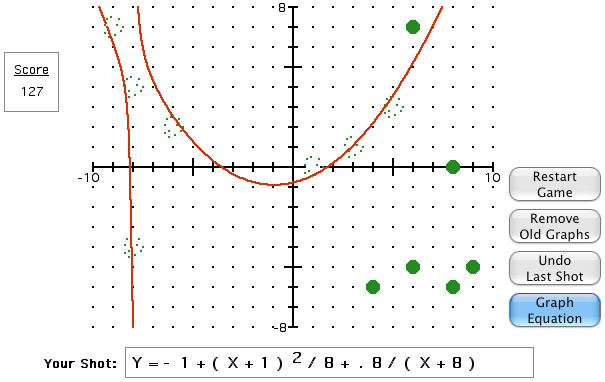 PC and Mac versions of Green Globs & Graphing Equations, Relating Graphs to Events, and Escape! Latest revisions to Updates page: January 2, 2014, update of December 3 Green Globs Pkg.app. January 2, 2014, versions of Green Globs Pkg, Escape, and Relating Graphs for Intel Mac's with OS X Lion and later. No-charge site licenses for teacher centers, colleges, and university departments involved in teacher education -- see How To Order. For email orders or international orders, see How To Order. For questions about the new versions, see FAQ. This is the original award-winning algebra and graphing software by Sharon Dugdale and David Kibbey, updated by the authors.